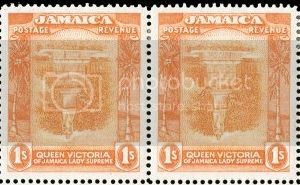 According to most accounts this "Inverted Frame" variety was discovered by a local collector at the small Post Office in Manchioneal, a village on the coast of Jamaica in March 1922. It is presumed that only one sheet of 60 must have had the error, with half the sheet going to Manchioneal and some being fiscally used, while, more than likely, the other half sheet going to Kingston, as a used copy of the error exists with a Kingston cancellation. Estimates vary among specialists of the exact number of these errors that still exist - some as low as only ten - to no more than approximately 20. One fact is certain, the phenomenal corner sheet-margin pair offered here from the Cunliffe collection is the only recorded pair and ranks among the most important rarities in British Commonwealth philately, in addition to being one of the premier Inverted Printings in the world.